It all started when I was given this awesome book of color~ I look at it often. Way too often I must admit. I dream about the walls becoming new again. A rebirth of color can make a house feel new I always say. That's where I get myself into trouble. That's when these two guys got together. Can you see the difference? It's lighter and less blue. Im in love once again. This shade works well with the rest of the room. 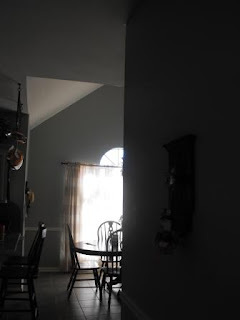 The color does seem to change as the light changes. Look what fabric I found at Hancock. Project # 4005....ha! Absolutely Love it!!!! !It is so warm and cozy!!!! !So pretty and PERFECT! Wow! It looks amazing! You amaze me. You just posted about painting the color you ended up not liking, and you've already repainted it??!!! Have you slept the last few days?! Wow! I love that blue. It's just gorgeous in your home. It is so pretty! I am so glad you lie it now! I can see why you love your new friend...I am glad that comfort gray has indeed brought you comfort! I have always wanted the job of naming paint colors! I just LOVE the color! I am thinking of going from golds and reds to blues and browns. Maybe at the first of the year. It is BEAUTIFUL!!!! I can see why you LOVE it!!! Do you even sleep???? How in the heck have you already re-painted it all????? It's a pretty color, very soothing! Love it Susie! 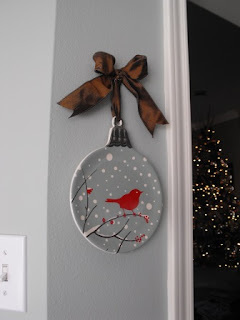 Love the plate also...so pretty! Alrighty, you have inspired me dear friend! If you can bear to paint one room TWICE during this crazy time of year, I should be able to get my act together to paint a bedroom or two! Everything looks beautiful. So Soothing. My livingroom is gray too, with deep red couches and white woodwork. Isn't it funny how colors look so different once their on the wall? It's beautiful & you're quick. It would take me til Christmas to get everything back in place. That's a great color. My mother-in-law actually picked out the exact same color for her new beach house. She brought the color book with her over Thanksgiving and showed me that one. Uncanny! Very very pretty. 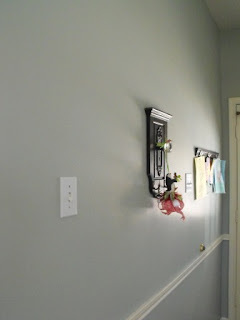 I love grays...they can be blue, or in the case of my house...green. An amazing color. 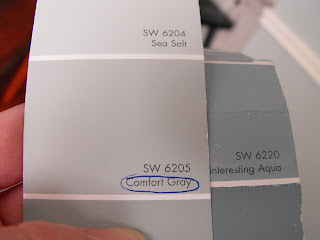 Your "comfort gray" is lovely! 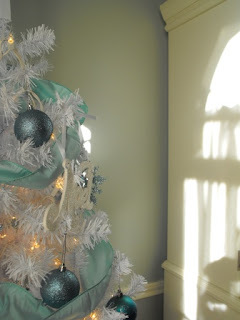 I LOVE your white tree with the blue accents! It is beautiful and it looks great with the "comfort grey!" It's beautiful Susie! I saw that color and am considering it for the condo. I have two Sherwin Williams fan decks, trying to make a decision. It's absolutely PERFECT! What a beautiful shade, and you are so right...it's no where near gray. Blue and brown, two of the most gorgeous colors when combined! p.s. i cannot beleive you found the time to paint 1 room twice during this crazy holiday season. You're my hero! Now you have inspired me to maybe use that comfort grey in my living room with the new dark brown leather. Hmmmm. I was thinking sage but I like that one. 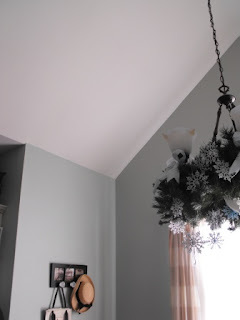 Check out what I made today......I made a ragamuffin garland! It looks great!! I love that color! Oh so pretty! I just bought a gallon of "Cloudy Amber" paint for our bathroom today--nervousness sits in when you put the brush to the wall for the first time; I'm already feeling it. I love the color and it looks beautiful in your kitchen. Great color! I love how soft and inviting it looks! I am glad you found something you love! Great job, the tears were worth it! Hey, Susie, oh I know all about paint that doesn't work too. And I think blues are about the hardest ones to get right. I painted a bathroom 3 different blues before I finally loved it. 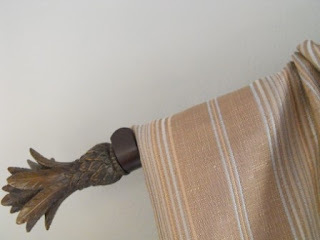 And when I just did my beachy guestroom, I picked one that I thought would be perfect & it was just too drab. Had to go a little more aqua to make it work in my dark room. I loved Pat's DR too, but I don't think that color would have worked for me either. 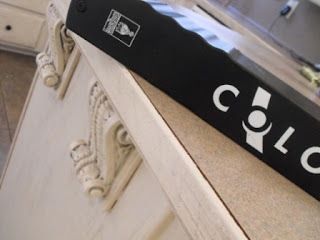 I also considered your colorstrip too, but thought it would go TOO gray in my lowlight room, so I ended up with Rainwashed. It needed a little green in there. I've seen Oyster Bay & Sea Salt (on your strip) in a showhouse & it was gorgeous, so I know that strip is a winner. So glad you hung in there & got the color you wanted! It's SO hard sometimes. I currently have an aqua kitchen...much bluer and brighter than your first paint choice. But we sold the house and now I get to find a colour for my new kitchen. I love your Comfort Grey. I like tones that work as both a colour or a neutral. So pretty and soothing. I knew you would find the perfect color! It's gorgeous. Now the questions is...at my house one thing always leads to another...is this color going to do that? :) Isn't that part of the fun? It looks PERFECT!! I LOVE it!! I hope you can get some rest now! The color systems are so fantastic these days. My design office is filled with what I loving refer to My Grownup Crayolas. I believe however you made a fair concession! :) Your space is fabulous! I LOVE that color with brown too! CUTE plate! Beautiful Susie! I'm so glad you're not crying anymore! Very pretty -- we have a color that changes like that. One way I love it, one way I don't. I'm trying to figure out what to do with it. I was going to pull out my SW paint deck for you until I saw this new post!! Your new color is absolutely stunning! It's perfect!!!! Our main rooms upstairs are painted Conservative Gray with an Austere Gray accent wall. Very similar. I love my SW paint book! Very, very nice! And that fabric is great, too. 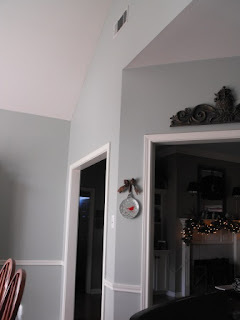 I have used a similar color in my last three houses, Silver Sage by Restoration Hardware. 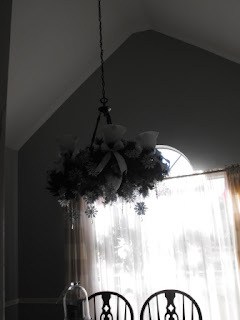 It also changes in the light, bluish, grayish, greenish. It defies description. Love the color! great choice. Great color! You're right, it's absolutely beautiful with brown! Loving the little plate too. 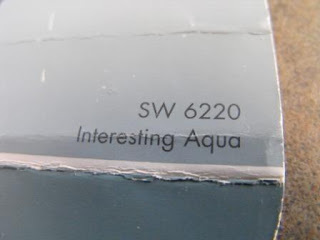 I'm finding this very funny because my Interesting Aqua swatch looked just like yours, but it was too blue on the walls and I switched to Comfort Gray. I love it!